Whether you’re going green or just love the color like we do (Diane von Furstenberg’s interpretation of mint in her spring collection, anyone? ), we share our favorite green hair products so you will be St. Patrick’s Day-ready this year. Plus, everything is under $30! It’s time to channel your inner leprechaun with these fun and totally eye-catching hair products to ensure you will have that “Kiss me, I’m Irish” moment at the end of the rainbow on March 17. Believe us when we tell you there’s nothing easier than incorporating these green products into your hair routine to be effortlessly festive on the big day. Not only does this strikingly luxe shampoo have green packaging, but it’s green too — meaning it is comprised of five natural oils! Something that comes from the environment and still leaves your hair smooth and silky soft after you wash… what could be better than that? First off, this bottle basically screams St. Patrick’s Day with the green and gold packaging, apothecary-inspired font and the light lily scent. Plus, this product will instantly hold any hairstyle for that St. Patty’s Day night out. So, if you choose to go big and voluminous with your hair to be insanely festive, you won’t have to worry about your locks falling flat. 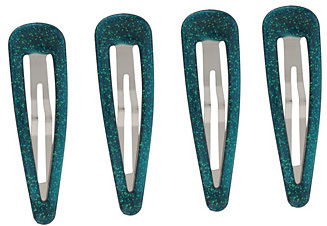 If you’re looking for a simple way to add that touch of green to your look on March 17, add one or two of these glittery clips to your ‘do. Believe us; the touch of sparkle will instantly make you stand out at any party. Try clipping one strand of braided hair behind your ear for that effortless and classic look we all adore. OK, while we know sunglasses are technically meant for the face, you will look totally retro-chic with these shades placed on top of your head this St. Patrick’s Day. Our tip? Pull back your hair and use these as your version of a headband for that ultimate cool girl look.